Visual attention is a relatively new area of study combining a number of disciplines: artificial neural networks, artificial intelligence, vision science and psychology. The aim is to build computational models similar to human vision in order to solve tough problems for many potential applications including object recognition, unmanned vehicle navigation, and image and video coding and processing. In this book, the authors provide an up to date and highly applied introduction to the topic of visual attention, aiding researchers in creating powerful computer vision systems. Areas covered include the significance of vision research, psychology and computer vision, existing computational visual attention models, and the authors' contributions on visual attention models, and applications in various image and video processing tasks. This book is geared for graduates students and researchers in neural networks, image processing, machine learning, computer vision, and other areas of biologically inspired model building and applications. The book can also be used by practicing engineers looking for techniques involving the application of image coding, video processing, machine vision and brain-like robots to real-world systems. Other students and researchers with interdisciplinary interests will also find this book appealing. Liming Zhang is a Professor of Electronics at Fudan University, where she leads the Image and Intelligence Laboratory. Since the 1980s she has been engaged in biological modeling and its application to engineering, such as artificial neural network models, visual models and brain-like robot models, and has published three books in Chinese on artificial neural networks, image coding and intelligent image processing, as well as over 120 pages in the area. Since 2003 she has been studying problems in modeling visual attention and applying it in computer vision, robot vision, object tracking, remote sensing and image quality assessment. She has served as a Senior Visiting Scholar at the University of Notre Dame and Technical University of Munich. Weisi Lin is an Associate Professor in the division of computer communications at Nanyang Technological University's School of Computer Engineering. He also serves as Lab Head, Visual Processing, and Acting Department Manager, Media Processing, in Institute for Infocomm Research. Lin has also participated in research at Shantou University (China), Bath University (UK), National University of Singapore, Institute of Microelectronics (Singapore), Centre for Signal Processing (Singapore). His research interests include image processing, perceptual modeling, video compression, multimedia communication and computer vision. He holds 10 patents, has written 4 book chapters, and has published over 130 refereed papers in international journals and conferences. He is a Chartered Engineer, and a Fellow of IET. Lin graduated from Zhongshan University, China with B.Sc in Electronics and M.Sc in Digital Signal Processing, and from King’s College, London University, UK with Ph.D in Computer Vision. 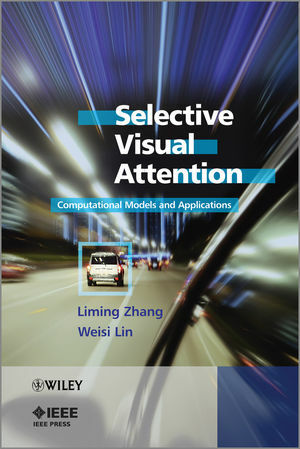 Selective Visual Attention Visit the companion website to access the MatLab code examples presented in the book.